If you have a synth with a filter capable of self-oscillating, it can be a lot of fun pushing it to its max. A screaming resonant filter is probably more engaging than most plain oscillators and the patches generated generally fit nicely into any project. 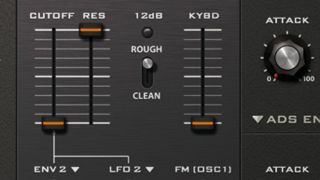 The best way to get started with this flavour of FX is to produce a simple wobble or sweep with a few modulation routings and some light processing. Once you've mastered that, you'll be able to create just about any sound you like with your new found sound source. For much more on creating FX with synths, pick up Future Music 290, which is on sale now. Step 1: Here, we'll take a brief look at how to instantiate and control a self-oscillating filter. We start with a straight-up saw wave oscillator being manipulated using a simple low-pass filter. The filter movement is automated so as to make the changes more evident later. Step 2: The resonance is cranked to its maximum setting. Simultaneously turn the level of all other oscillators to zero. All you should hear now is the self-oscillating filter. The result in this case is the same automation, audible just with a very different resonant tone. Step 3: Finally, try adding some noise to your new sound. This will make things sound a little grittier and a bit more analogue. Also try processing the patch with some reverb or delay.